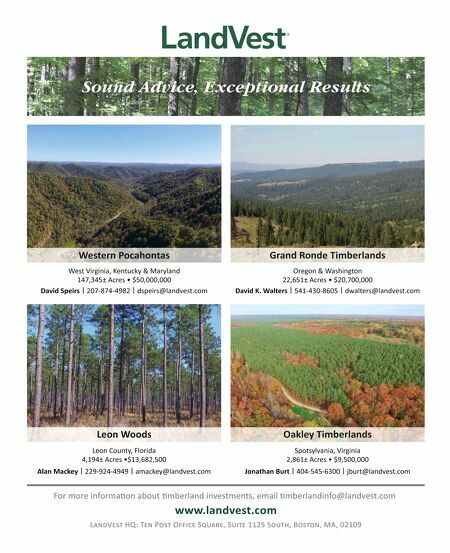 S P R I N G 2 0 1 6 | The LandReport 19 LANDREPORT.COM FrontGate T R AV E L T R AV E L | L A N D ' S B E S T F R I E N D | TO P T E N | I N V E S T I N G | E S S E N T I A L S | E V E N T S A Far West Texas ranch has gone from running steers to racing to the forefront in the next chapter in manned space flight. As of April 2, Land Report 100er Jeff Bezos has successfully launched the New Shepard booster from a spaceport on his 290,000-acre Corn Ranch on three occasions. (Prior launches occurred on November 23 and January 22.) In each instance, the spacecraft flew above the Kármán Line — the boundary between earth's atmosphere and outer space — before returning to the remote Culberson County ranch and landing vertically at its launch site. Although Internet-based retailing forms the basis of the e-commerce company Bezos founded, he readily admits that the item he prizes above all is a used rocket. "The rarest of beasts," he calls it. To Bezos, rocket-powered vertical landings are a crucial step in the pursuit of Blue Origin's goal of "millions of people living and working in space." "New Shepard flew again yesterday, reaching an apogee of 339,178 feet, or 103 kilometers. It was the third flight with the same hardware," wrote Bezos in a post published on Blue Origin's website on April 3. He added, "We pushed the envelope on this flight, restarting the engine for the propulsive landing only 3,600 feet above the ground, requiring the BE-3 engine to start fast and ramp to high thrust fast." 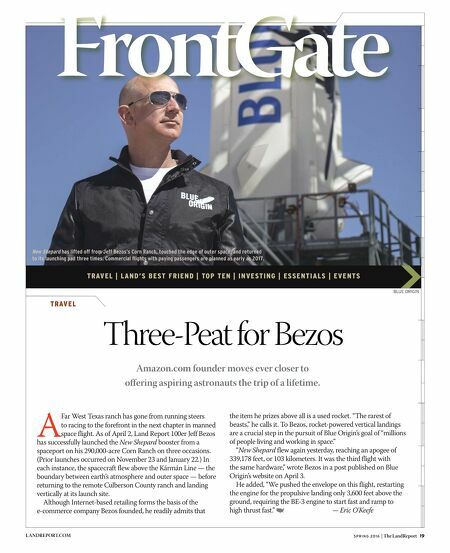 — Eric O'Keefe Three-Peat for Bezos Amazon.com founder moves ever closer to offering aspiring astronauts the trip of a lifetime. BLUE ORIGIN New Shepard has lifted off from Jeff Bezos's Corn Ranch, touched the edge of outer space, and returned to its launching pad three times. Commercial flights with paying passengers are planned as early as 2017.